Signals (Kilpisjärvi), Leah Beeferman Digital print on fabric, 100x200cm, 2018-19 and Cobh House, Bedroom Window, Alex Yudzon, archival pigment print, 50 x 40 inches, archival pigment print, 2017. Sirius Arts Centre is pleased to present Field Recordings, an exhibition of work by New York-based artists Leah Beeferman and Alex Yudzon. Stemming from ideas that were conceived while both artists were on separate residencies at Sirius Arts Centre, the work considers their individual experiences of the natural world and their interpretations of it — be it the remote locations of Beeferman’s photographic documentation or Yudzon’s interventions in both man-made and natural environments. The work is presented as a series of large-scale photographs (Yudzon) and immersive digital drawings on fabric (Beeferman) that convey a sense of stillness, beauty, decline and birth of the natural environment. The work considers what is visible, and what is absent or hidden, in both the locations and the resulting pieces, but also how the artist might construct or build the work from material that is discovered or stumbled upon while on a residency. Both artists share a sculptural approach in the making of this work. 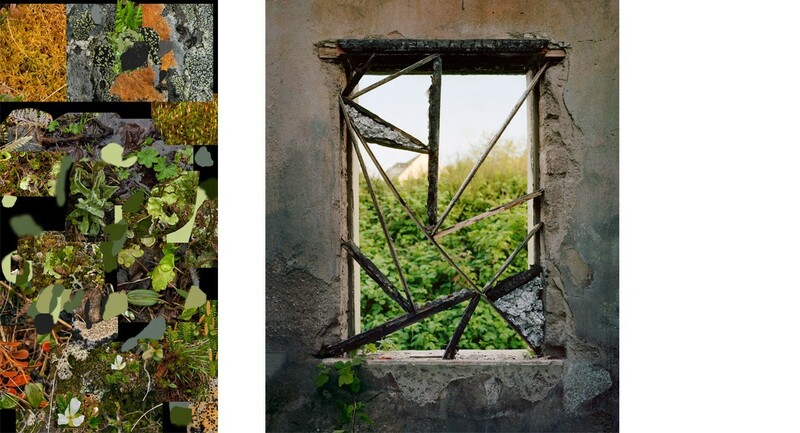 Yudzon creates his site-specific installations in abandoned architectural or natural environments and then photographs them, and Beeferman makes photographic documentation in remote natural landscapes and then later, in the studio, combines them with digital drawing to create abstract, painterly works on fabric. In his work, Alex Yudzon chooses locations that were once centres of frequent activity, abandoned houses, military outposts, overgrown gardens and hidden backyards. Although stripped of their intended purpose these sites are not dormant, they contain vestiges of past use and are continuously altered through a process of natural entropy and the occasional trespass of human visitors. Working within the framework of the architecture of a given space and using both the natural and man-made debris gathered at the site, he creates sculptural arrangements that evoke settings of primitive domesticity. He uses only the materials found in each site, reinscribing life and the promise of new use on to vacant and marginal structures. Autonomous photography pieces are created on the basis of these installations, and the final installations are not deconstructed but left intact to add to the history of entropy already at work in each setting. Leah Beeferman’s digital prints explore shifting relationships between landscape, abstraction, form, photography, scientific information, and digital space. Rather than “objectively” representing the landscapes she photographs, she presents her varied experiences and interpretations of them — reflecting how complex such landscapes can be. Her digital marks are gestural and non-representational, though they inherit substantial meaning from their interactions with the photographic images. They augment the expressiveness of the natural world, and imply what may not be immediately visible: scientific information, an observer’s experience, or natural activity at scales that cannot be perceived. Alex Yudzon is a New York based multi-disciplinary artist working in photography, painting, installation and performance. Yudzon’s work explores our tenuous relationship to the idea of home as both a physical reality and a construction of the mind. His photographs and paintings have been exhibited widely both within the United States and abroad. Leah Beeferman is a New York City-based artist working with landscape through digital image-making, photography, text, sound, and video. Her work explores the relationships among observation and abstraction, natural and digital, physical and experiential. She has exhibited widely, has participated in numerous international residencies, and was a recipient of a Fulbright grant to Finland from 2016-17.